Tonight's review is a cigar that was generously sent to me by Kevin at Butthead's Tobacco Emporium. The CAO #7 Blend is the latest release from the CAO Escaparate collection and is exclusive to Butthead's. The Escaparate line are cigar blends that CAO does not have enough tobacco (for one reason or another) to produce enough sticks for a full release. That said, these cigars are always somewhat limited and I, almost always, find fun to smoke. Some details on the #7, taken from the sales sheet I received with the cigars. The Escaparate #7 blend is the prototype blend for the CAO Vision. Although the specific tobaccos that comprise the #7 remains a secret, the Dominican Corojo wrapper and Dominican Binder as well as the Nicaraguan and Brazilian fillers that became the Vision are certainly assumed and very well blended in the mild/medium cigar. The CAO Escaparate #7 is a tightly packed, hefty cigar. I've been leaning towards smaller ring gauges recently, so it was interesting to smoke something a little thicker. The wrapper was silky smooth and had no visible veins. The torpedo cap was constructed to perfection and it clipped evenly and cleanly. The pre-light aroma from the cigar was of faint earthy tobacco and the cold draw was similar in taste. After toasting the foot of my CAO Escaparate #7 I was hit with a rather rough, bitter spice. The smoke was dry and didn't leave a nice finish on my palate. Luckily, after a few puffs, that profile went away and I was greeted by a much nicer, rich tobacco flavor with hints of almond. I can only assume that the cigar heated up too quickly or some dust was in the foot of the cigar which produced that initial unpleasant taste. As I burned through the first third, the cigar mellowed out even more and the body came in at a mild to mild-medium. In the second third of my CAO Escaparate #7 is when the flavors really picked up. The spice from the first third was completely gone and now some complex notes of molasses and a strong roasted peanut taste had emerged. I found both of these to be very interesting and kept me wanting more. The burn on this cigar was perfectly straight and required no touch-ups. The finish of the smoke was also very interesting, as it seemed to leave your mouth with a cold, fresh feeling. 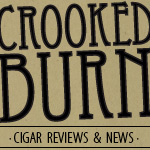 I haven't smoked many cigars with this kind of finish, so it was definitely worth noting in this review. Again, like in the first third, the body was a mild to mild-medium. The final third of this cigar was very similar to the second third. The flavors stayed the same with a creamy molasses and a strong roasted peanut taste. The flavors seemed to blend very well together and were really pleasant. Toward the very end of the cigar, I did pick up some leather notes that were not present before. I wished these flavors would have come on sooner to further add to the mix. Overall, this is the best stick I have smoked from the Escaparate line from CAO. I don't think I would rank it as high as the La Traviata, but I would put it right up there with the LX2 and the Brazilia as far as some of my favorite CAOs. The burn is perfect and, right in the middle of the cigar, it was producing some excellent flavors and smoke profiles. A big thanks again goes out to Kevin at Butthead's Tobacco Emporium for sending me a few of these cigars to review. Would I buy it again? I would most certainly buy this cigar again and keep five or so on hand. With the Escaparate line, you never know how long they will be around and I would love to smoke more of these in the future. Would I buy a box? I'm not sure what a box of these goes for, but my guess it is not on the cheap side. I would lean more to 5 packs than a box purchase. Thanks for the review Dan! The spice that is noted after toasting is consistent in all the sizes. The CAO Vision pedigree makes me want to try this smoke. I love the Visions. Could you detect any similarities to the Vision? Thanks for the review. Nice job. I would say it has some vision flavors. But I think the vision if I recall has more power to it then this.